Even the coolest Smurf needs advice from time to time. Capcom's Smurf Life challenges you to bring light to Smurf Village, no easy feat with a variety of quests divided into Construction and Alchemy. What is Moon Dust? How do you build things? Will Gargamel succeed in bringing doom to all Smurfs? Relax. Everything will be just fine after reading this Smurf Life Cheats and Tips guide, provided by Capcom and developer Beeline Interactive. Note: You can find these tips in the game's Help menu, located on the main screen. Navigation: Tap where you want your Smurf to walk, or hold to have your Smurf run toward your finger. Harvesting Resources: Tap on a rock, tree, flower, etc. and then tap the tool icon above it. It costs energy every time you harvest something (rarer resources will cost more). Expanding to other areas will also provide new resources. Resources can be spotted by the energy tags above them. Smurf Count: This is the number of regular Smurfs you have in your village. Keep rescuing Smurfs to increase this number. Energy: You spend points of energy every time you harvest things like water, rock or flowers. Energy points are regenerated over time. Trade Tokens: These tokens can be traded for items with certain Smurfs. Tap on a Smurf and select "Trade" to see what they have available. Moon Dust: This is a paid currency. It can be used for things like speeding up crafting, or buying special items. It costs real money. Quest Log: This tells you which quests you currently have. Tap on a quest to view completed tasks and what your current task is. Tap "Track" to find what you need for your next task. Compass: Tap on this icon in the bottom-left corner when you need help finding a resource, Smurf of object that you've tapped before. Select "Track" to find what you're looking for. Just follow the sparkling trail. -Inventory: Tells you how many resources or items you are carrying. It has a limited amount of space. -Wardrobe: What your Smurf is wearing. You can alter our Smurf's appearance from here. -Profession Levels: Tapping on either of these will let you see how good you are at each craft, and how many more items you need to craft to level up in a profession. -Menu: Tapping this button will return you to the main menu of the game in case you need to change any options or view the help file. -Trading Post: This Bulletin Board acts as the trading post for the Smurfs. You can visit it for odd jobs to do around the village. Tap on it for a random quest. Complete these quests to earn Trade Tokens for Trading. -Profession: These are the quests you do for your trainer. These quests introduce you to new recipes and increase your profession level. -Expansion: Many Smurfs were trapped by the storm. You'll need to get rid of the obstacles that are blocking the different areas of the village. 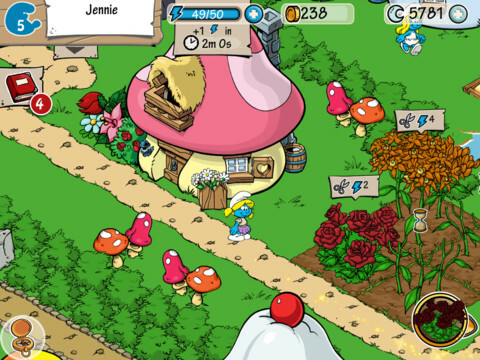 -Smurf Quests: In order to add more Smurfs to your Smurf count, you need to help each Smurf fix their house in some way. Every time you help a Smurf, you get to attend a party and more of the storm clouds will disappear. -Alchemy: Potion making, taught by Alchemist Smurf. -Building: Carpentry, taught by Timber Smurf. Profession Level: Your job level is your overall level in a profession. The more stars you earn, the better this level will be. Your trainers can teach you new recipes as you level up. Recipe Level: Complete recipes a number of times to earn a recipe level, which earns you a star (the color matches your job). As you gain stars in a craft, you'll be able to make them faster. Tap and hold the "i" to learn more about each recipe. As you get better and better at a craft, you'll need to make more of them to level up. What if I run out of space in my inventory? Check out the bulletin board to see if any of your items can be used for trades there, and/or spend Moon Dust to expand your inventory. Where can I get dye? You can get dye from Painter Smurf, who is south of your hut, and north of the party area. Where can I get cloth? You can get cloth from Tailer Smurf, who is south of your hut, and north of the party area. Where can I get Magic Plant Remover? You can buy Magic Plant Remover from Papa, Timber, Alchemist, Tailor or Painter. I'm being asked to complete a recipe I don't have yet. What do I do? More recipes become available as you level up in a profession. Keep crafting items to increase your level and learn more recipes. Go see your trainer after every level up.